• Learn the basics of beginning piano. • Deepen the connection to and understanding of the music through dancing and singing. • Be inspired by learning about famous composers. • Book and CD included. 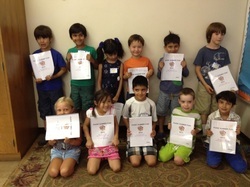 "Thanks for such a great week of piano camp! Vikram really enjoyed it. When my husband got home last night he did a mini "concert" for him since he wasn't able to make it to the week's end performance. Then shortly after, Vikram sat down (on his own without being asked) and composed a song. He played it for all of us and sang his newly composed song while he played. This past week at camp gave him more music tools to use that just fueled his interest to play around more. Much more fun then telling him to "practice" all the time!"